Welcome back! Happy "spring ahead" day. :) I look forward to using the extra hour of daylight to go for a run later... It's definitely starting to feel like spring in Boston with temps in the high 40's and low 50's. I wonder if we'll get one more winter storm though?! I wouldn't be surprised!! Alrightie, enough small talk and onto food talk. I have a super easy and delicious dinner recipe for you today....not a usual baked dessert or breakfast treat! One evening last week I didn't have a lot of time in the kitchen, but I was craving veggies - cooked veggies, not raw. A delicious green salad with a variety of veggies is a common go-to easy dinner for me, but I just wasn't in the mood for a typical salad. So instead, I made a quinoa salad! I have come to really love and appreciate quinoa. You may remember that I've written about it once before when I made Butternut Squash Black Bean Quinoa Salad last fall. 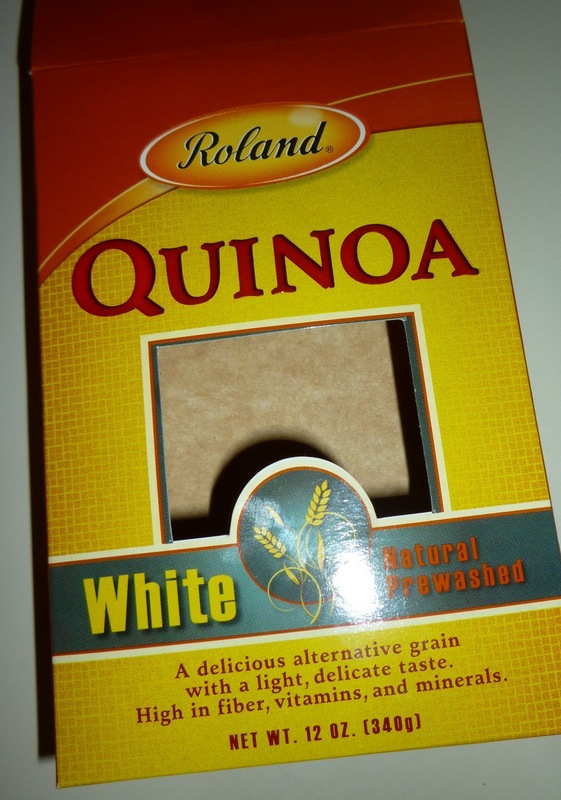 Quinoa is incredibly tasty and healthy. If you haven't had it before, I encourage you to buy some the next time you're at the grocery store! I think you'll be glad you did. First, I sauteed onions, red peppers, and mushrooms in extra virgin olive oil on the stove over medium heat. I added the mushrooms only for the last few minutes of the cooking; they took much less time to cook than the onions and peppers. I kept the seasonings basic with these veggies - just used garlic and rosemary! I had roasted sweet potatoes earlier in the week, and I had some leftover. Perfect to add to this dish! I warmed them up on the stove when the rest of the veggies were cooking. I used white quinoa, but you could easily use red too. For the quinoa, I cooked one cup of it with two cups of low sodium chicken broth. I've made quinoa with water before, but I much prefer it when made with broth. It adds so much more flavor! Cook according to the directions on the package. When the quinoa was super close to being done cooking, I threw in some chopped spinach so that it would wilt. Love how green that spinach is!! YUM. At this point, the quinoa was done cooking so I turned off the heat. Next, I added about 1/2 can of rinsed and drained small white beans. Then I topped the quinoa, spinach, and white bean mixture with my veggies, and voila - dinner! Simple as that. for the upcoming warmer months. YAY! Successful weeknight dinner. And I had plenty leftover to eat for a few more meals too! St. Patrick's Day is later this week! Can't wait! I've already made one batch of the Barbershop's traditional irish soda bread. This year I made it into individual scones though, as you can see here. Fun fun! So delish looking dearest! Making some of this goodness this week!